Restaurant Equippers works with a number of top-level providers of financing and leasing solutions. Listed below are several companies that may meet your needs in helping to assist you in getting the equipment you need for your business. If you already work with a different provider we may still be able to assist you. Please contact our National Order Office to speak with one of our professional associates who can assist you in working with your financing partner. Marlin Business Services Corp.® is a nationwide provider of commercial financing and depository products. Marlin specializes in providing innovative financial solutions for small and mid-size businesses. U.S. Financial Services Inc. offers lease/finance programs with no penalty for early payoff, fast turnaround, competitive rates, and excellent customer service. Providing finance options to both new and existing businesses. With over 30 years of experience, Vendlease provides Plain English Contracts, minimal up-front costs and competitive terms for all your equipment buying needs. Sign up is quick and easy! 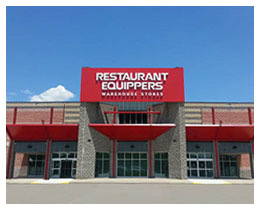 NOTE: Restaurant Equippers is not affiliated with any financing or leasing agency. Your approval and/or acceptance of financing is based on variables determined by each of the independent offering organizations. Restaurant Equippers has no role in determining credit worthiness or other terms. Any acceptance of credit or financing is solely between you and the third party vendor.